Lace Corals comes in some crazy bright colors, and the California Hydrocoral is a beauty! The California Hydrocoral Stylaster californicus tends to have a variety of growth patterns from delicate lace formations with pointy tips to a dense network of fragile branches. It is quite attractive in colors of purple to pinkish purple or orange, on a smooth surface. Stylaster corals can occasionally be encrusting, or heavily arborescent (tree-like). But more often they have finely laced structures with delicate branches, growing on the same plane. They have thick tissue and a smooth surface. Their colors are truly crazy bright; pink with white margins and tips, or orange, yellow, white, and purple. Some common names these pretty animals are known for are Lace Coral, Hydrocoral, Fire Coral, and Rose Lace Coral. The Stylaster genus belongs to the class Hydrozoa. It is found worldwide, in all oceans, extending to the Arctic and Antarctic. The only exceptions are the extreme colds of the northern and southern waters of the planet. They are called a hydrocoral, not a stony coral due to their internal structure. They do produce an aragonite and calcite skeleton, yet inside they are canals. These canals house all of the polyps and aid in food distribution. This tubular structure makes them nowhere near as dense and hard as a stony coral. The Stylaster corals also do not have the potent sting of their close relative, the Millepora Fire Coral. The Lace Coral is from subtropical waters. Being a deep water coral, the Stylaster corals usually need cooler tanks and a lot of food. These hydrocorals are difficult to care for because they do not use light for nutrition and tend to die from dietary deficiencies. They need micro zooplankton, bacterial particulates, and small particulate organic matter. Feeding them regularly with plankton and similar preparations may help, but such large amounts of plankton can pollute captive environments. Another important need they have, next to a strong linear water movement, is shade. Beautiful filming of this pink beauty. The California Hydrocoral is found in cool waters ranging from 42.8 to 55˚F (6 to 13˚C), which means a chiller is a must! The tank should be 100 gallons or more and at least a year old. This corals is difficult to almost impossible to keep alive long term due to the copious amounts of plankton it needs to live. This level of feeding pollutes closed systems. Some have tried skimmerless, algae-scrubbers, Jaubert or the Monaco systems with limited success. Best left in the wild. The Stylaster genus was described by Gray in 1831.This genus is a member of the Stylasteridae family. There are at least 48 species, with a few being S. californicus, S. elegans, S. hattorrii, S. lonchitis, S. roseus, S. sanguineus, and S. venustus. The Stylaster genus has not been propagated in captivity, at least not on a commercial level, and it is not on the IUCN Red List for Endangered Species. California Hydrocoral Stylaster californicus is found along the California coast. The Stylaster genus are found all over the world’s oceans. The only exceptions are the extreme colds of the northern and southern waters of the planet. Some common names these hydrocorals are known by are California Hydrocoral, Lace Coral, Hydrocoral, Stylaster Coral, and Fire Coral. The Stylaster corals are found in cool waters at depths from 40 to 180 feet (12 - 55 meters). They occur in groups under shaded ledges, caves, and overhangs where they avoid strong sunlight. The flat part of the coral faces into a strong current where it can make use of the passing plankton and other prey. They use the venomous cells (nematocysts) found in their tentacles to catch prey in these nutrient rich waters, but also to sting and deflect any possible threats or attacks. The Lace Corals Stylaster sp. can grow from 6 to 12” (15 - 30 cm) in height. The Stylaster genus can be encrusting or arborescent, and form mostly lace structures that grow on the same plane with pointy and delicate branches. They can also have slightly thicker branches with blunt tips. This genus is not considered a stony coral due to its internal structure. They do produce a hard calcium/argonite skeleton, yet inside are canals that house all of the polyps and aid in food distribution. This makes them no where near as dense and hard as a stony coral. Their surface is smooth with thick tissue, which aids in prey capture. The colors of the Stylaster sp. can be pink with white margins and tips, or orange, yellow, white, and purple. On the smooth surface there are lines of small pores called, gastropores, that come in two sizes. The larger polyps are called gastrozooid polyps. They tend to stay within the corallum, (not extending outward past the surface of the coral), and help to digest food and pass it through the colony within the skeletal structure. There are 2 to 3.smaller pores, called dactylozooids, running in a line on each side of each gastrozooid polyp. Dactylozooids look like tiny hairs that stick way beyond the surface, giving the hydrocoral a fuzzy appearance. They consist of two types of hairs, with one being typical of the hydrocorals and the other being much longer and sweeping. The dactylozooids sweepers sting prey, and with the help of the shorter dactylozooids, will then bring the prey toward the gastrozooid polyp, which will then engulf and digest it. However, the Stylaster corals do not have the potent sting of their close relative, the Millepora. The California Hydrocoral tends to have a variety of growth patterns including delicate, lace formations with pointy tips and a dense network of fragile branches. In faster, stronger water movement, they can form a plate-like growth at the base, with longer slightly thicker branches with blunter tips. This depends where they are found on the reef. They are purple to pinkish purple or orange in color, and prefer cooler waters. Being from much deeper waters that have a lot less sunlight, they need a lot of plankton and other prey to survive. The Rose Lace Coral tends to have a more branchy formation, and grows on one plane. They are found in the Caribbean and like other cool water species, need shade and good water movement. Being a deep water coral, the Lace Corals usually need cooler tanks and a lot of food. These hydrocorals are difficult to care for since they do not use light for nutrition, thus they need a lot of plankton and other prey to survive. However, large amounts of plankton can pollute captive environments. Not having a skimmer may help them to survive since they need the very things that the skimmer takes out, but they are not a skimmer substitute. The most important need they have, next to a strong linear water movement, is shade. Aquarium Hardiness: Difficult to Impossible - They require cooler water, and the need for heavy feeding of plankton can pollute the tank. Stylaster corals tend to die from dietary deficiencies. They need micro zooplankton, bacterial particulates, and small particulate organic matter. You may help them by regularly feeding them plankton and similar preparations, but such large amounts of plankton needed for their survival can pollute captive environments. Position them in a way that the broad side of the coral faces the current so when feeding, they can make the best use of their structure as you send food their way. Stable tank conditions are required to keep the Stylaster genus. Do typical water changes of 20% a month, 10% biweekly, or 5% weekly. It has been noted that 5% weekly water changes replenish many of the needed additives. Although they are similar to a “soft coral,” they have aragonite and calcite skeletons, so need parameters similar to hard corals. Additions of iodine are also recommended. Iodine Levels: - Additions of iodine are recommended. A typical reef environment is what is needed for your Lace Coral. The minimum tank size is 100 gallons or more, with linear currents that can carry food through the branches. A mature tank (well over a year old) is advised to increase the chance of successfully keeping a Stylaster. Mono specific displays, consisting of just this one species, are suggested for their continued survival. Light can easily bleach them, so keep them in caves or overhangs if there is bright light in the tank. A chiller is needed since the Lace Coral lives in subtropical temperatures that range from 42.8° to 55° F (6° - 13° C). Because this coral needs high levels of nutrients, some have tried not to use a skimmer. Alternatives methods include an algal turf scrubber, which is a natural filtration that utilizes light to grow algae, thus giving the aquarist the ability to filter their tanks in a manner similar to the way that oceans and lakes operate. Other alternatives are a Monaco or Jaubert system. Substrate Type: Any - Substrate for saltwater tanks only. Temperature: 42.0 to 55.0° F (5.6 to 12.8° C) - S. californicus needs to be in a cool water tank, providing a chiller can help with this. Specific gravity: 1.025-1.027 SG - 1.026 is the best. Water Movement: Strong - Linear flow, not turbulent. Water Region: Bottom - Lower regions or anywhere in the aquarium that provides shadows. The Stylaster genus is semi-aggressive. Yet due to its natural habitat, any corals that need light will likely not grow near this hydrocoral. Various fish will perch on this coral awaiting the little commensal creatures that live within its branches to come out to dinner. Stony corals are Cnidarians, meaning stinging celled animals. They don't usually have a strong sting from their tentacles, but they do emit chemicals to ward off other corals competing for the same space. Though closely related to the Millepora Fire Coral, they do not have the potent sting. Venomous: Yes - Their tentacles sting other corals, so wear gloves when handling them just in case. Anemones: Monitor - Only cold water anemones. Anemones wander, so keep an eye on them. 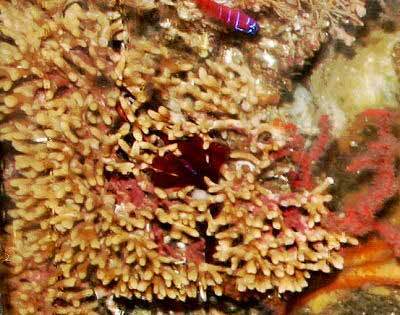 Mushroom Anemones - Corallimorphs: Monitor - Cold water species, not located near Lace Coral. Leather Corals: Monitor - Cold water species are okay but do not put near Lace Coral. Zoanthids - Button Polyps, Sea Mats: Monitor - Cold water species are okay but do not put near Lace Coral. Shrimps, Crabs, Snails: Safe - Cold water species are okay. Starfish: Safe - Cold water species are okay as long as they don't eat the Lace Coral. Feather Dusters, Bristle Worms, Flatworms: Safe - Cold water species are okay. Clams, Scallops, Oysters: Monitor - Cold water species are okay. Crabs: Safe - Cold water species are okay. Snails: Safe - Cold water species are okay. Sea Apples, Cucumbers: Safe - Cold water species are okay. Urchins, Sand Dollars: Safe - Cold water species are okay. Nudibranch, Sea Slugs: Safe - Cold water species are okay. Stony Corals: May be aggressive - Cold water species are okay but do not put near Lace Coral. Soft Corals: May be aggressive - Cold water species are okay but do not put near Lace Coral. The Lace Corals primarily consist of hydroid colonies. These usually have separate sexes consisting of either male or female members. Thus each colony can produce only one type of gamete, either eggs or sperm. There is not usually both sexes in the same colony. The Stylaster hydrocorals predominant body type is the polyp. Animals in the polyp stage are known as “hydroids”. Their life cycle originates as a sessile polyp, and in this stage it multiplies asexually. The Stylaster genus form ampullae that produce gonophores. These gonophores stay attached to the colony during reproduction. The Stylaster genus has not been propagated in captivity, at least not on a commercial level. Due to the poor survival in captivity and their natural reproduction method, disturbing this coral is not suggested for propagation. Ease of Breeding: Difficult - Not suggested. The ailments of the Stylaster genus are largely unknown. Light will cause algae growth which will kill them, if they don’t bleach out first from over exposure to light. The Stylaster genus is very hard to find at pet shops and on line. These corals could be sold under “Hydrocorals” or “Fire Corals”. They may possibly be special ordered from a local fish store. It's best to make sure you are getting a tropical specimen, as cold water species require much more stringent tank requirements.